It's not always easy being green in Southern California, where some wet seasons can fizzle wihtout much rainfall before the hot, punishing summer months. But the region is wearing a little more green this St. Patrick's Day, courtesy of winter's steady stream of rainstorms. The before-and-after NASA images above show the region in 2016 -- during five straight dry years -- and 2017 near the end of one of California's wettest winters in years. The 2017 images, provided by NASA's Aqua satellite, show more green and swaths of richer colors, especially in the Inland Empire. You can also see more snow in the Southern California mountains. 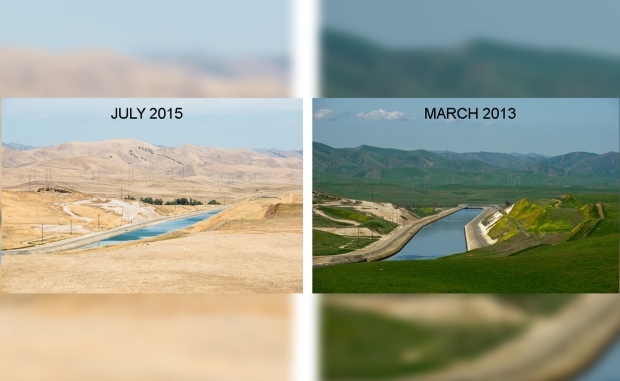 At this time last year, more than 93 percent of California was in some type of drought. Only 8 percent of the state is in drought this week, according to the Drought Monitor report issued Thursday. That figure includes part of northern Los Angeles County and Orange, Santa Barbara and Ventura counties. The only part of the state in severe drought is extreme southeastern Imperial County. At this time last year, 74 percent of California was in severe drought.